Brighten up your home and create gorgeous gifts with a colourful array of garlands, faux botanicals and much more. Rachel Henderson and Jayne Emerson will inspire you into creating your own boho paradise made from felt with fresh green faux succulents, cheese plant leaves and needle-felted cacti. Wall hangings and mobiles are a brilliant way to change the look of a room quickly, and there are some great ideas here: try a leaf door curtain, a felt bead chandelier or a daisy wall hanging to bring a handmade touch to your décor. 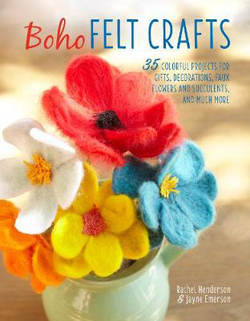 With beautiful illustrations guiding you every step of the way, you will feel confident in embracing a wide range of techniques for working with felt, a versatile and inexpensive material with endless possibilities.